Honor your child on their birthday by donating a book to the Elsa England Library. Books may be selected and purchased from the selected titles in the library for $15.00. A bookplate with the honoree’s name and birthdate will be placed in the front of the book, and he/she will be the first to check out the book. The honoree’s name will also be added to our Birthday Book display in the hallway. 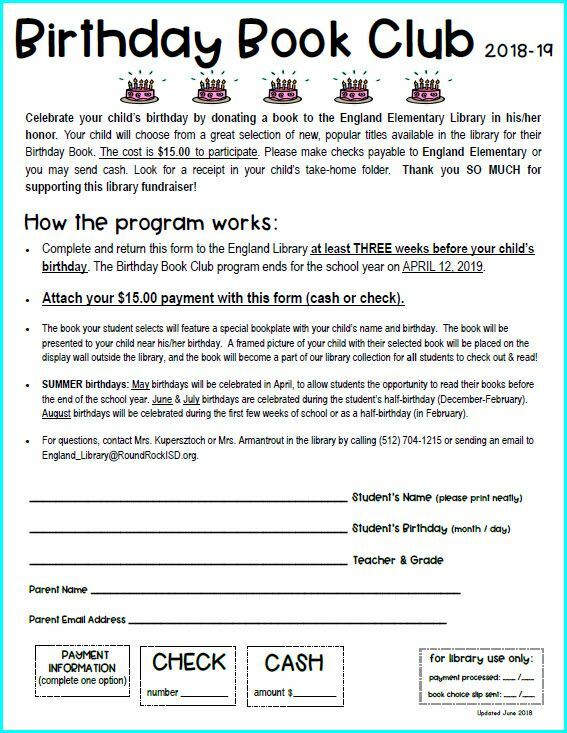 Print and fill out the Birthday Book Club form at the bottom of this post or pick up a form from the library. Please attach payment of $15.00 at the time of enrollment in the Birthday Book Club. A few weeks before your child’s birthday, we will send a reminder for them to come by the library to select a book. The book will be presented near your child’s birthday and they will be the first student to check out their special book. We can celebrate your child’s birthday no matter when it was– don’t worry if it has already passed! Details for summer birthdays are noted on the form. Please note: the program ends on April 12, 2019 for this current school year, so we may ensure your child can check out their book before the end of the school year! Click the image below to download and fill out the form to join the Birthday Book Club. Thank you for supporting our library!